The seeds planted at Samhain, laid dormant at the Winter Solstice, moved on their own at Imbolc, sprouted the Spring Equinox, fertilized at Beltane, grew vigorously under the Sun of Summer Solstice, and ripened at Lughnasad, are in the middle of the harvest season as the days, now once again are of equal light and darkness. In the cycle of manifestation of, say, an idea, the Autumn Equinox is point where the idea has become manifest, has grown through fertilization and the nurturing of Mother Nature, and is now more than ready for harvest. The end of the cycle (at Samhain) is in sight. And the light at this time of year while at a point of equality, has the momentum of moving towards the darkness. Just the opposite of the Spring Equinox, which has a similar evenness of day and night, but the momentum is toward the light. Equinox means "equal night," and anywhere on the Earth, given a level horizon, the Sun rises due East, and sets due West. Equal day and night. But, while equal and balanced, in the northern hemisphere, the momentum is definitely towards the darkness of Winter. The Autumnal Equinox happens once a year. At this time, because of the motion of the Earth around the Sun and because the Earth is tilted, the Sun crosses over the Earth's equator on its way South. The Autumn Equinox is one of the Four Quarter Days of the year. It marks a major mid-point of two of the seasons - even though Autumn officially starts on this day, in the Celtic Calendar, it marks the mid-point of the season of harvest which began at Lughnasad and ends at Samhain. Gathering in the fruits of our labors. The Holi/Holy days around this time reflect this reality. In the United Stated, Labor Day - the first Tuesday after the first Monday in September - marks the beginning of the Autumn Equinox season. Labor Day recognizes the value of those who labor, and it gives them a final fling at the end of Summer. September 10 - Dagobert, Frankish king c.612–c.639. The last of the Merovingians to exercise personal rule in France was said to be of the blood line of Christ (see "Holy Blood, Holy Grail."). 9/11/2001 - The destruction of the Twin Towers in New York. A grim harvest by the Grim Reaper. A blatant attack on the hegemony of the Unites States. September 15 - Octave of the Nativity of Mary [PCP (Paris); WTS (Bruges)] This feast was established by Pope Innocent XI in 1683. What gave occasion to the institution of this feast was the desire of all Christendom for a solemn thanksgiving which would commemorate the deliverance of Vienna, obtained through the intercession of Our Lady, when the city was besieged by the Turks in 1683. An army of 550,000 invaders had reached the city walls and was threatening all of Europe. It marked the greatest incursion of a Moslem army into Europe. John Sobieski, King of Poland, came with a much smaller army to assist the besieged city during the octave of the Nativity of the Blessed Virgin, and made ready for a great battle. Some say that Al Quaeda and Osama bin Laden chose the 11th of September 2001 to revenge the defeat of the Moslem armies at Vienna in 1683 on that same date. September 21 - Matthew, apostle, evangelist. On this usual day for the Autumn Equinox, the Church chose to celebrate Matthew, the tax collector, who gave up everything to follow Jesus. His name in Hebrew means (according to the "Metaphysical Bible Dictionary") Gift of Jehova; gratuity of Jah: given wholly unto Jehova. Of the four evangelists, he is represented by the man, or water bearer, which is in the sign of Aquarius which symbolizes the taking of the message out in to society. September 24 - John the Baptist (Conception) - This man figures greatly in our yearly cycle. as the pre curser to Jesus, the man whose job it is to say that the Light is coming, celebrates his birth day (appropriately) nine months later on the 24th of June, the first day after the Summer Solstice, when one might be able to see that the light is going away. Incidentally, the Annunciation to Mary is on March 25th - nine months before Christ's birth. September 29 - Michaelmas Day - Michael, the archangel, and All Angels (Hebrew: "Who is like God ?"). St. Michael is one of the principal angels; his name was the war-cry of the good angels in the battle fought in heaven against He-who-has-no-name and his followers. In Normandy St. Michael is the patron of mariners in his famous sanctuary at Mont-Saint-Michel in the diocese of Coutances. In Germany, after its evangelization, St. Michael replaced for the Christians the pagan god Wotan, to whom many mountains were sacred, hence the numerous mountain chapels of St. Michael all over Germany. There are Michael hills all along the Michael Line in England including the Glastonbury Tor, which is dedicated to St. Michael. Michaelmas Day, in England and other countries, is one of the regular quarter-days for settling rents and accounts; but it is no longer remarkable for the hospitality with which it was formerly celebrated. Stubble-geese being esteemed in perfection about this time, most families had one dressed on Michaelmas Day. 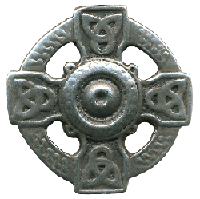 In some parishes (Isle of Skye) they had a procession on this day and baked a cake, called St. Michael's bannock. 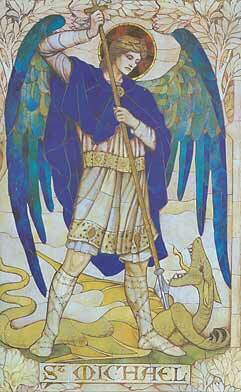 It is appropriate to mention Archangel Michael here as he pinned down the Earth Energies dragon with his spear, and marks the final turning point towards Samhain, and the death of the Celtic Year. The Equinox is the time to try egg balancing. Take a raw egg out of the fridge the night before so it warms up to room temperature. On the Equinox, you will find that you can balance the egg on a flat surface, on its fat end. It doesn't work right away (I think it takes time for the yolk to settle), but keep at it, and suddenly, it will feel like it locks, and you can remove your fingers, and it stays there - balanced on its fat end. Honest. What is at that balance point in your life?